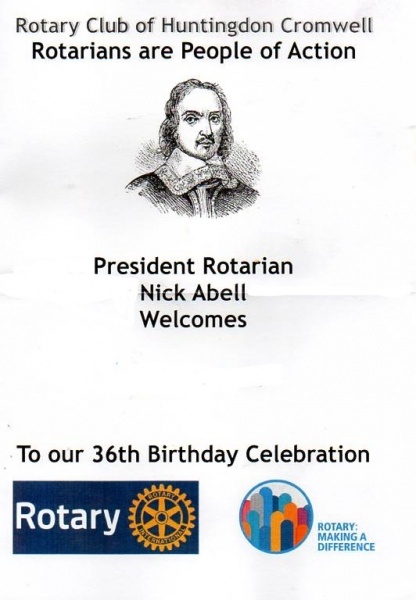 Rotary Club of Huntingdon Cromwell - Welcome! Huntingdon is one of the four principal towns in the District of Huntingdonshire, the others being St Ives the home of the Chapel on the Bridge, St Neot's the largest town in the County of Cambridgeshire and Ramsey which was built up around the gate of Ramsey Abbey. The Club adopted its name from Oliver Cromwell who was born into a family which was for a time one of the wealthiest and most influential in the area. Educated at Huntingdon Grammar School, now the Cromwell Museum, and at Cambridge University, he became a minor East Anglia landowner who made a living by farming and collecting rents. It was the civil wars of the 1640s which lifted him from obscurity to power. 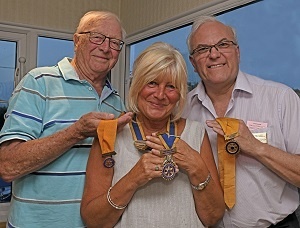 The Rotary Club of Huntingdon Cromwell meets at 7.15pm on Mondays (except Bank Holidays) - at The George Hotel, George Street, Huntingdon, Cambs PE28 3AB. Visitors are welcome and should contact the Club Secretary, Bryan Swain, on 01480 417553 by 9am on the Friday. The Club has over the past 10 years donated £124,731 to international, national and local causes. For a full list go to DONATIONS_AND_AWARDS_UP_TO_2018_3.xlsx This money has, in the main, been raised through the efforts of Club members who have embraced the Rotary ethos of 'Service Before Self'. Just take a look below to see the events that have taken place in the Rotary Club of Huntingdon Cromwell throughout the Rotary year. These events have not only generated fun and friendship but have raised sigificant funds (see lists above) that have or will be donated to primarily local charities. If you are interested in making a difference and joining a fantastic organisation read the "Welcome to the World or Rotary" and contact us through this site. Seen here are Rotarians Janet and Lawrie Cooke with hundreds of squashed cans collected by Rotarians. The cans will be held centrally and recycled to pay for a helipad at a hospital. As for the ring pulls, Rotarian John Sadler is collecting them and sending them to Africa where they will be made into various trinkets such as necklaces and handbags. Out of the Blue we received a message from Wincanton for Homebase in Huntingdon that they had over £1000 to donate to the Club. They had raised the money through 50% of pool table takings, a table tennis competition, a Christmas Raffle and the Jackpot Joker. 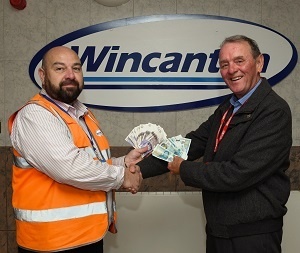 Here we see Gary Craddock, General Manager, presenting the cash to Rotarian Bryan Swain, Club Secretary, at their Headquarters in Corby on the 23 October. Seen above are the happy band of Rotarians and wives who attended the annual District 1070 Conference in Torquay in September. A good time was had by all!!!! On 1 July each year the line up of senior officers in the club changes. Here we see on our right Alisdair Wotherspoon who takes over as Vice President. On our left is Past President Lawrie Cooke who will take over as President Electg - he will assume the role of President for 2019 - 2010. But in the centre is our new President Mim Piper. As can be seen this is a cheerful event that took place in the village of Holme. Once again the Club together with the Huntingdon Club hosted nearly 100 children from Thongsley Field School for a free day out at Wicksteed Park. This annual event arranged for our area by our own Rotarian Bryan Swain takes over 2,000 children to the event. The sun shone (as usual) and carers, Rotarians and most importantly the children had a fantastic time. Here we see the crowd of Rotarians who visited Germany in May. They had a fantastic time and were hosted by the local Rotarian club. The where treated to banquests, mayoral greeetings and visits to a number of facilities. Another example of the social side of Rotary. 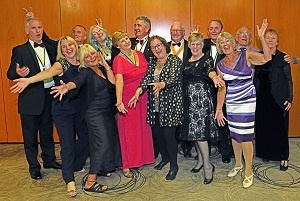 A very succesful 36th Charter Night Dinner was held at the Marriott Hotel in Huntingdon on the 28 April 2018. The President presented Paul Harris Awards to Rotarians Chris Shannon, Martin Stephenson and John Alford. He also presented the Award to two carers who supported Michael day as they tended to Jenny Day in her long illnes. The District Govertor Chris Davies was also present. See photos for pictures of the presentations. The Club held its annual Vaudeville Night at The Buckden Village Hall on 23 Feb 18. The event saw a packed line-up of acts take to the stage to put on what has been hailed as "the best yet". The picture shows the finale line up with compare Past President Chris Shannon thanking participants and the audience. The show raised more than £1,500 for local charities. 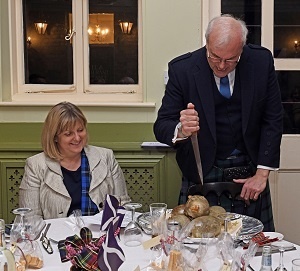 The Club held a Burns Night at the Black Bull in Godmanchester on the 12 February. Seen here is Rotarian Alisdair Wotherspoon attacking the haggis!!! Seen here is Lucy Gabe the winner of the Club's Young Chef competition who went forward to the District 1070 final. Above the is the fantastic meal she prepared. Once again the Club held a very succesful Boxing Dinner at St Ives on 26 January. Seen here is the President presenting a cheque for £759 to Christine Tailor for the Cambridgeshire Police Boxing Club who helped to organise the event. A carpenter and his family from Buckden have been given a helping hand by our club to get back on their feet. Simon lost his job making log cabins last year and was forced to sell his tools to pay bills and put food on the table. The stress of losing his job took its toll on Simon, after a visit to his doctor, was admitted to hospital with a disease to his heart muscles. He was put in a coma and spent a month in intensive care. To add to the family troubles the upshot was that they were evicted from the home in which the family had lived for 15 years. 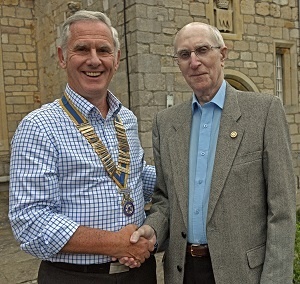 However, after hearing his plight, the Rotary Club of Huntingdon Cromwell stepped in to help. The Rotary Trade Aid organisaation that sends boxes to organisations in Africa was approached for help. They exceptionally agreed agreed to provide Simon with a box of tools seen in the photograph. Simon added "I was over the moon with the efforts of Rotary". The Club also provided a great deal of support to the family over the Christmas period. Another brilliant job by The Rotary Club of Huntingdon Cromwell in support in our local community. Once again our club is supporting local good causes. Last month we donated over £800 to the special accommodation at Coneygrear on the Oxmoor. The money provided soft play equipment for the children. Seen in this photograph are some of our Rotarians with residents and their children. 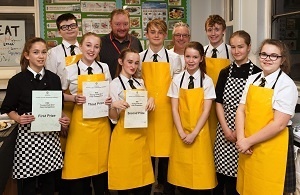 YOUNG CHEF 2017 WAS ONCE AGAIN A GREAT SUCCESS WITH OUR LOCAL YOUNSTERS PRODUCING FOOD THAT WAS OUTSTANDING. THE EVENT SPONSORED BY OUR CLUB IS HELD ANNUALLY AND THE WINNER GOES ON TO THE DISTRICT COMPETITION IN 2018. 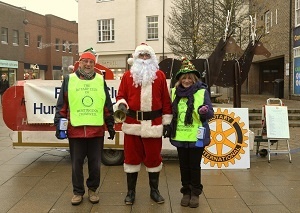 Here we see Rotarian John Aked and President Elect Mim Piper supporting Santa in the Huntingdon Town Centre. They were out collecting funds to support local good causes in the run up to Christmas. Mim told the Hunts Post that all the monies collected will go to charity and this year we have made significant donation to Magpas and Coneygear Court. The team also opened Huntingdon's Christmas market when the lights were switched on. Last year Rotary and the Round Table made over £7,500 for local good causes during the Christmas charity collection rounds. Young carers in Cambridgeshire were given a festive boost by the Rotary Club of Huntingdon Cromwell. 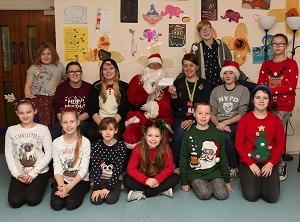 The Club handed over a cheque for £300 to the Carers Trust Cambridgeshire as the young carers were enjoying their Christmas Party on 3 December. The party was held at the Huntingdon Youth Centre with about 60 youngsters in attendance. On 25 November we supported the very first switch on of the Christmas Lights on the Green in Brampton. The day was a huge success and was attended by over 1,500 people. 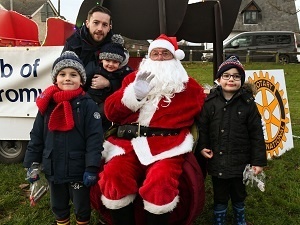 The Brampton Events Group thanked the Club for providing a float for the visit of Santa. Santa raised about £150 for the Rotary Kids Out event in June. 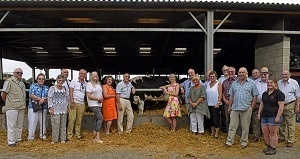 Once again Rotary is seen as supporting major charities in the East Anglia Region. In October the Rotary Voices donated £1,000 from a concert. In November the Rotary Club of Huntingdon Cromwell supported MAGPAS in its unclaimed luggage sale - this raised a staggering £8,049.80. Every year Rotary takes youngsters from around the area to Grafham Water for a 4 day leadership award course. The participants take part in a variety of events that strengthen their leadership ability. 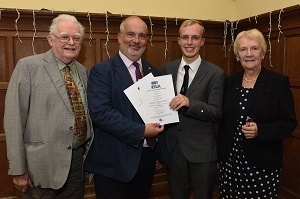 This year the Club sponsored Joseph Drury who is seen here received his certificate from the President. Also to the left is John Alford and to the right Helen Swain - both of whom put Joseph forward for this character building course. The President of the Club, Nick Abell, is seen handing over a cheque for £250 to Jim Stephenson who is the Head Ranger at Paxton Pits Nature Reserve. The Club has supported the work of the reserve in the past and Jim has visited the club to give talks on a number of occasions. Grafham Water Sailabilty has recevied a specially designed wheelchair to help member as they enter and leave their boats. The donation was organised by John Beer who is one of the newer members of the club. The unique chair was donated by John's friends Ann and Chris Cannon whose daughter Tania was a member of the sailability programme in Oxfordshire before her death in 2010. Sailability is a charity which enable people with disabilities to enjoy geting out on the water. For further information on Sailabiltiy visit "grafhamwatersailability.org.uk"
Dozens of people packed into All Saints Church in St Ives on Friday 11 August for a fundraising evening of entertainment. 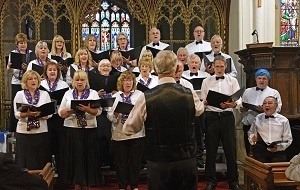 Hosted by the Rotary Club of Huntingdon Cromwell the event started with a performance by the Rotary Voices Choir making its second appearance since it was formed in October last year. A number of artists also gave up their time to perform and you can see more in the photo gallery. 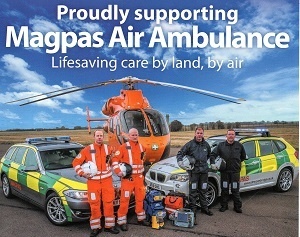 All proceeds raised on the night were split between Magpas air ambulance and St Ives and Brampton Parish Churches. 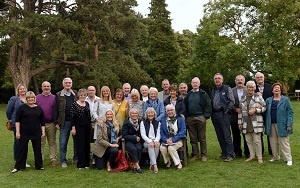 Once again on Monday 31 July a number of club members, partners and friends visited Tolethorpe Hall for the Stamford Shakespear Company's rendition of "Much Ado About Nothing". The event was a great success and was preceded by a picnic. On the evening of the handover outgoing President Chris Shannon presented the Paul Harris Fellowship Saphire Award to Reg Dixon. Reg, who is now an honorary member, was a founder member of the Club and is a Past President. The award recognises his outstanding support to the club and to the Cambrdge Police Boxing Club over many years. A fully deserved award.